Could it be more timely? A radical satire about America’s history of slavery and enduring black and white stereotypes at the Unicorn Theatre captures the country’s zeitgeist with amazing accuracy. I’ve never seen a play quite like “An Octoroon” by New York-based Brandon Jacobs-Jenkins, winner of the 2016 MacArthur Fellowship. He uses an 1859 melodrama as a foundation for acute observations about art, perception and, of course, race. Framed as a play within a play, the material also allows Jacobs-Jenkins room to probe the craft and art of theater. Plays about play-making usually have me bolting for the nearest exit. But “An Octoroon” defies expectations at every turn. Jacobs-Jenkins gives us a script at once comic, acerbic and thoughtful. Jacob-Jenkins’ raucous and cerebral play demands to be taken seriously. His lack of fear is breathtaking. The Unicorn production, directed by Damron Russel Armstrong, is officially a co-production with UMKC Theatre and showcases some phenomenal performances. The design work is generally excellent. A Broadway melodrama, “The Octoroon” by the prolific 19th-century Irish playwright Dion Boucicault, is Jacobs-Jenkins’ point of departure. Boucicault’s play opened at the Winter Garden Theatre in 1859, the year before the Confederates kicked off the Civil War by firing on Fort Sumter. Subtitled “Life in Louisiana,” the plot depicted the lives of plantation slaves and masters, crooked land deals, villainous scoundrels and a young white heir’s love for a beautiful young woman who is one-eighth African-American — the octoroon of the title. Jacob-Jenkins’ play opens with a comic monologue by BJJ (Rufus Burns), who introduces himself as a black playwright and describes his therapist’s efforts to get at the cause of his malaise. That leads us to his fascination with Boucicault’s play and his desire to stage it. But he has a problem. BJJ can’t find enough white actors willing to play racists in a Civil War-era melodrama (they defer by saying racism is “complicated.”) By the same token, he can’t fill all the slave roles with African-American actors. As if those aren’t enough levels of perception, Jacobs-Jenkins also introduces Boucicault (Logan Black), identified as the Playwright. Presumably transported from 1859, the Playwright, true to the Irish stereotype, is drunk when we first meet him. Later in the play BJJ and the Playwright deliver what amounts to a quick educational seminar on the mechanics of five-act 19th-century melodramas. Sounds dull, I know, but like everything else in this play, the information is delivered with an audacious flourish. Cinnamon Schultz delivers an inspired farcical performance as Dora, a southern belle who exists only in the play within a play. The poised Jessica Franz appears as Zoe, the title character. A group of attitudinal house slaves rounds out the cast: Minnie (Rasheedat “Ras” Badejo), Dido (Amber McKinnon) and Grace (Teisha M. Bankston). The production’s utility infielder is Peter Morgan, who appears as a drunken riverboat captain and recurs as a giant rabbit. (The rabbit’s presence is explained if you pay attention to the opening monologue). Much of humor the stems from the incongruity of the house slaves gossiping in contemporary vernacular. Bajedo, who has lurked around the theater scene in Fringe Festival performances, now gets to demonstrate her phenomenal comedic gifts to a general audience. Her performance as Minnie is simply riveting. She exhibits maximum physical control and lightning mood changes. Her interplay with the talented McKinnon and Bankston produces some of show’s sharpest humor. But the top acting honors go to Burns, whose phenomenal sense of timing and flexibility are stunning. Burns in a blond wig is inherently comical and his whiteface smile is terrifying. Late in the show he must play both hero and villain simultaneously, aided by a costume that is white on one side and black on the other. They try to outbid each other for Zoe during a slave auction and eventually struggle in a knife fight. You have to see it to believe it. Burns always makes an impression, but I’ve never seen him perform at this level. Black also must summon maximum flexibility as he alternates between the Playwright, an Indian chief and a slave auctioneer. His work here is expansive, smart and memorable. Black brings charismatic grace to the stage. Tristan James’ scenic design imagines an abandoned theater where scenery for the melodrama is accomplished with moveable flats and bare suggestions of antebellum grandeur. Particularly imaginative are Caroline Allander’s costumes — over the top when they need to be, understated when appropriate. Lighting designer Shannon Barondeau and assistant Hector Quintero make a vivid contribution, as do sound designers Jae Shanks and Jesus Rivera. I found the first 15 minutes on opening night to be spellbinding. The first act lagged a bit before intermission, but I have few nits to pick. Viewers do need to sit up and pay attention because the story shifts from one level of “reality” to another unpredictably. But overall, director Armstrong exerts masterful control of the material. This play toys with conventions and challenges its viewers to the point that some theatergoers may feel uncomfortable in the face of all this farcical racism. But I think that’s the point. If racism doesn’t produce discomfort, something’s wrong. 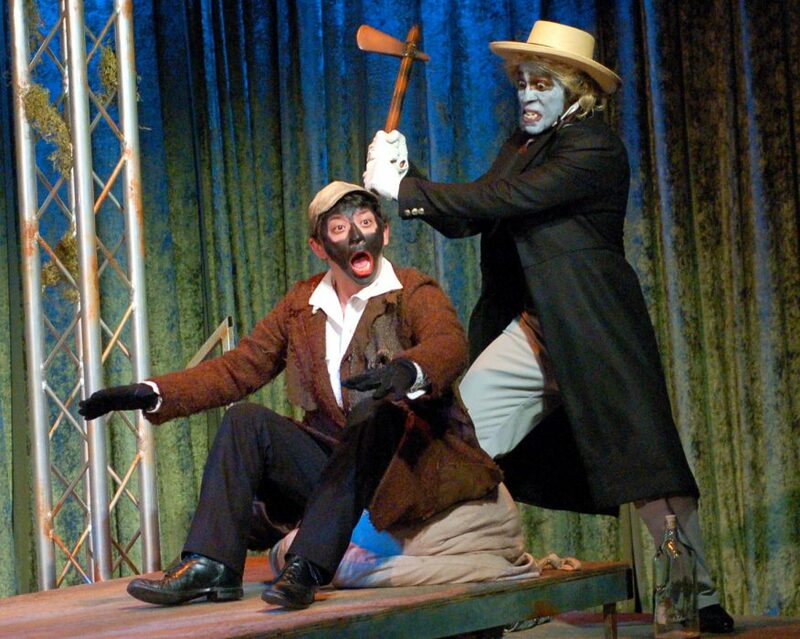 Audacious and fascinating, “An Octoroon” is my kind of theater. 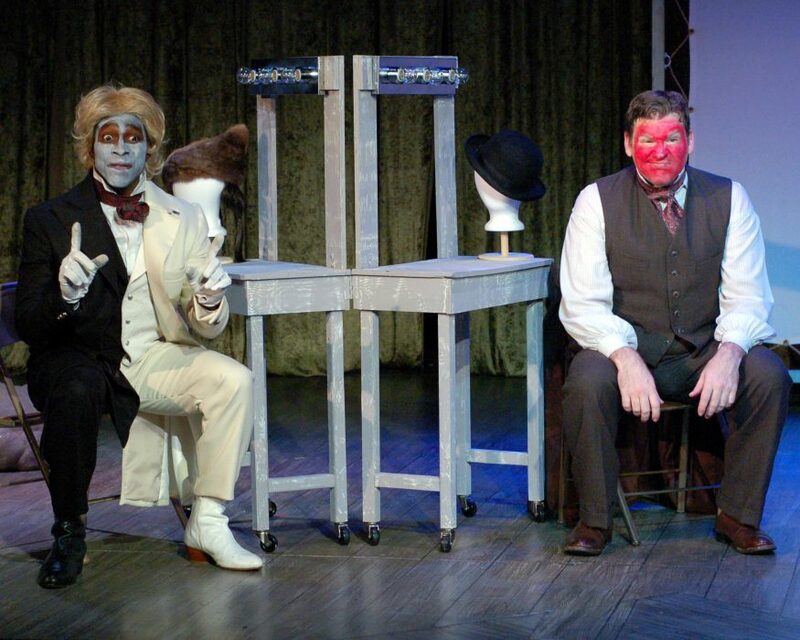 “An Octoroon” runs through Dec. 26 at the Unicorn Theatre, 3828 Main St. Call 816-531-7529 or go to www.unicorntheatre.org.